The beauty of using the Tollsmart apps is that they work just like your favorite navigation app, so you don't need to know the entrance or exits for the lanes, you simply enter your starting and ending locations and the app will dynamically display where Express Lanes are available along your route. Express Lanes will display as double red lines on the map so you can easily see the segment of the highway where these lanes are an option. The minimum and maximum prices still appear on the screen for those drivers not planning to leave immediately, while those who are can view the current price by tapping on the double red lanes. This will pop up a window that displays the current price for the segment they will be driving on, and additional information such as the transponder(s) that are required for driving on these lanes. You can enter additional information that will help the app pull the appropriate pricing based on a number of factors, such as the type of vehicle you are driving (car, truck, motorcycle, etc.) or transponder (E-ZPass, SunPass, etc.). There is also the option to enter the number of passengers, as that may enable you to drive for free provided you meet the minimum passenger threshold and have the appropriate transponder. Since most Express Lanes only charge tolls during rush hour you may be able to drive on these lanes for free off hours and Tollsmart will let you know when this is the case. 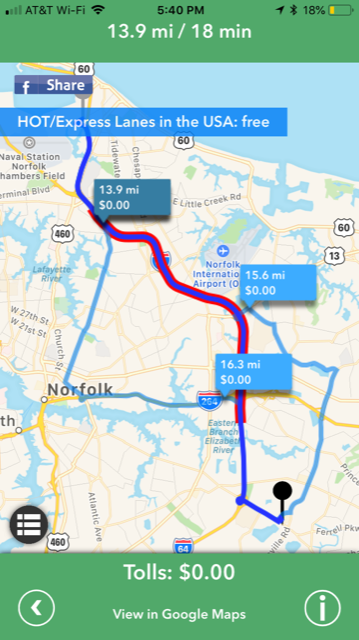 For example, the I-64 Express Lanes near Norfolk, VA are free to use outside of rush hour and we display that in the app (as depicted in screenshot). 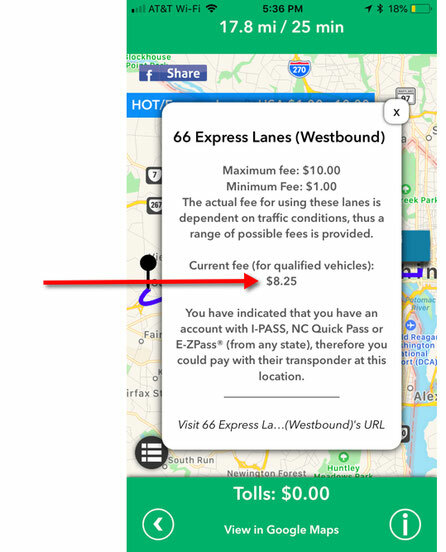 The Tollsmart app also uses predictive timing to estimate how long it will take to drive to the Express Lanes and applies the applicable fee (or if they are free, indicates that). Despite some similarities between the +30 Express Lanes systems currently operating across the US, there are also many disparities meaning that there really is no uniform approach to how these lanes operate. For example, the I-66 Express Lanes are unlike any other system in the US in that the entire highway is tolled during rush hour. This can lead to confusion, especially for travelers from outside the region who are unfamiliar with how these Express Lanes systems work, which is one of the reasons Tollsmart exists. We distill all the complex business rules from hundreds of tolling systems into a simple mapping interface to make it easy to quickly see how many tolls you'll encounter across any routes in North America, and how these tolls work! Given that Tollsmart is a Virginia-based company we're thrilled that the Virginia Department of Transportation (VDOT) has embraced an open data approach similar to other forward-thinking agencies on the West Coast such as WSDOT in Washington and VTA in Silicon Valley, both of whom we've worked with and who have made their Express Lanes dynamic pricing feeds publicly available to the developer community via APIs. This is a far smarter approach than shouldering the burden of having to create, market and manage consumer navigation apps, a skillset which, understandably, is not typically available in most transportation agencies. Instead VDOT, VTA and WSDOT are encouraging the developer community to innovate on top of this data, planting the seeds to 'let a thousand flowers bloom' instead of shouldering this burden themselves. 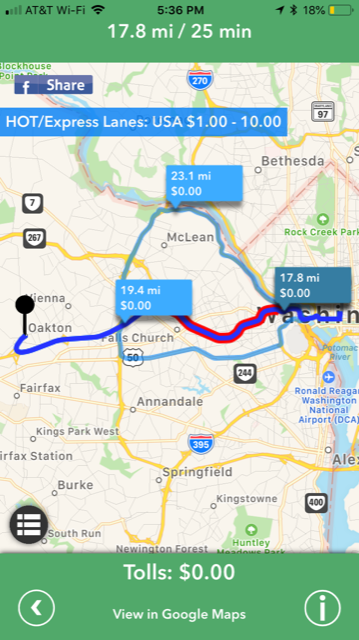 VDOT is making these real pricing feeds (along with much more data) available through their SmarterRoads Data Portal which they launched in 2017. We applaud this approach and encourage other transportation agencies and private operators of Express Lanes to follow a similar path to open up their pricing data as it benefits the traveling public in general by making it possible to add the prices in the navigation apps and services consumers have come to rely on. 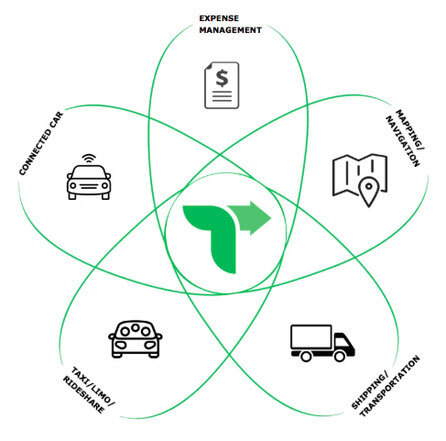 Our mission at Tollsmart is to provide full transparency around tolls so consumers and commercial customers will know in advance which tolls they'll encounter on a trip, how they work and how much (and how) they'll be charged. We do this through mobile and web apps, access to the Tollsmart API services and by licensing our aggregated data to companies providing navigation apps and services to commercial customers and consumers. Our goal is that no traveler is ever surprised or confused again by a toll or by a bill for tolls they've received at the end of a trip. If your company is interested in learning more about licensing Tollsmart's data sets send us an email for information on pricing and additional details.